A lean, ground bison patty topped with melted mozzarella cheese, a slice of roasted butternut squash and colorful butternut and cabbage slaw. Peel the squash. Cut the neck of the squash into 10 rounds, approximately ¼ inch thick. Season with salt, pepper and olive oil. Cut the base of the squash in half and remove the seeds. Season with salt, pepper, and olive oil. Roast the squash in a 400°F oven until tender, about 15 minutes for the rounds, and 30 minutes for the base. Cool and store the rounds for service and the base for the Butternut Squash Slaw. Combine Hellmann’s® Real Mayonnaise, roasted squash, Dijon, vinegar, chicken stock and cayenne in a blender and purée until smooth. Season to taste with salt and granulated garlic. Reserve refrigerated. To assemble, spread 1 T. Hellmann’s®/Best Foods® Real Mayonnaise on the heel of the bun. 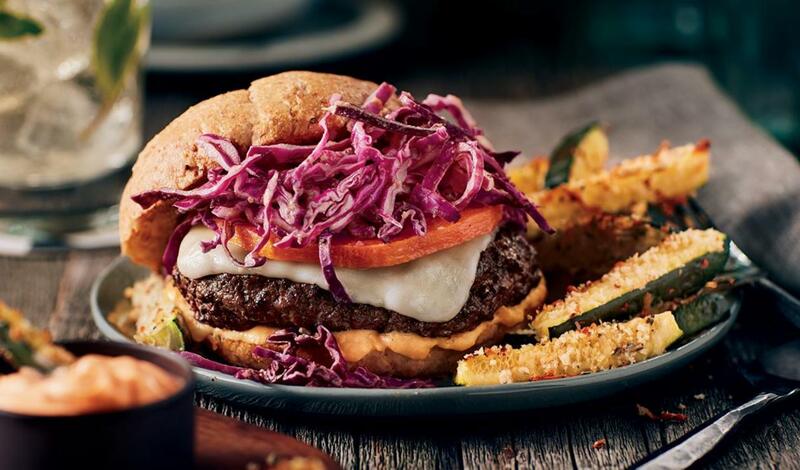 Add the grilled bison patty and top with mozzarella cheese, a Roasted Butternut Squash Round, 1 oz. of the Butternut Squash Slaw, and then top with the toasted bun crown. Serve.